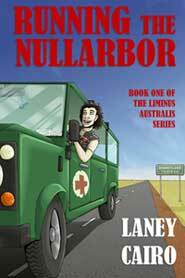 Today is our very own Starling and Laney Cairo’s Running the Nullarbor. When J. Alex Cook, a production assistant on The Fourth Estate (one of network TV’s hottest shows), is accidentally catapulted to stardom, he finds himself struggling to navigate both fame and a relationship with Paul, one of Fourth’s key writers. Despite their incendiary chemistry, Alex’s inexperience and the baggage they’re both carrying quickly lead to an ugly break-up. Reeling from their broken hearts, Alex has an affair and Paul has an ill-advised reunion with an old flame. Meanwhile, the meddling of their colleagues, friends — and even the paparazzi! — quickly make Alex and Paul’s real life romance troublesthe soap opera of the television season. But while the entertainment value may be high, no one knows better than Alex and Paul that there are no guarantees when it comes to love in Los Angeles. Times are tough in Western Australia. There’s a war on, though nobody will call it that yet. Dan, injured in the line of duty, now takes in orphaned children until the Red Cross can find a place for them. He’s become an old hand at looking after the kids, running his little hand crank radio, and just surviving. That is until Sid rolls up to his house on a motorcycle, claiming to be the uncle of the baby girl Dan is currently looking after. It isn’t that Dan doesn’t believe Sid, it’s just that the man knows nothing about taking care of babies and Dan doesn’t see how Sid is going to manage taking the child across the outback on his bike. Heavy bombing in the area prompts Dan to flee eastward with Sid and the baby, but neither Sid nor the baby are your ordinary humans and the so-called police action is becoming more and more of a war every day. Will Dan and his companions survive the army, the war, the outback, and, worst of all, Sid’s relatives to become something more than they are?